Being on the Antarctic field was my most remote experience ever: hundreds of miles away from the closest station, living in tents on man-food and visiting instruments that are revealing some of the many secrets of this mysterious continent. The flight from Rothera through Sky Blu to the Berkner island was the first of these three weeks. After several days of delay we finally took of from Rothera on the Dash-7 towards South. 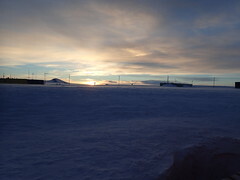 The big journey across the Europe sized British Antarctic Territory aiming to visit several remote monitoring sites, where the instruments spent the harsh Antarctic winter recording invaluable scientific data, has finally begun. Flying over the frozen land and sea and landing on rock, ice and snow with these robust airplanes and skilled pilots was one of the highlights of this journey that I surely won’t forget while I live. Our way lead South over the mountainous Antarctic Peninsula to the Sky Blu depot, where we spent a couple of days, before continuing our journey to the East above the vast Ronne ice-shelf. The total length of this flight was over 1000 miles (1600 km) and took about 6 hours. The typical flight height was around 8000 feet (~2700 m). 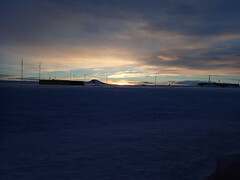 The full story of the journey and many details about the flights, the depots and the Antarctic field is available in the Antarctic Diary. Enjoy! Take care and expect more stories.